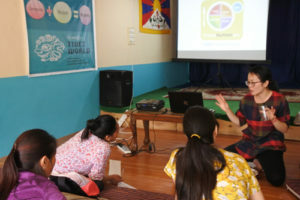 Tibet world organized a one day health talk for our students. We are happy to have Dr Suraj Sulya from UCMS and GTB hospital from Delhi. He discussed regarding Hand washing (prevention of infection), balanced diet, and general health and followed by question answer session. 20th April, 2018; Tibet world’s first ever student meeting held this date. Mainly focus on collecting student’s suggestion for better functioning of academic year. 22nd April, 2018; We are happily organized one week guitar class for our students, from 5:00pm to 6:00pm. We have our teacher Joao Leitao who is a music teacher. He is from Portuguese. Students love his classes. We would like to thank him from Tibet world family. 28th April, 2018 ; Tibet world organized a nutrition talk for pregnant women and kids under 2 years old. With guest speaker Ilisa Chang, who have master degree from case Western Reserve University, USA and have experience of 15 years in Asia as a nutritionist. 30th April, 2018; We have organized a special Tibetan class for students from 12:00am to 1:00pm. We have Mr tsering as our Tibetan teacher for few months. We would like to thank him. Welcome to Tibet World. Tibet World provides a platform for promoting education, raising cultural awareness and imparting Tibetan values to the world by inspiring people to initiate peace, harmony, and compassion.